Farmhouse is a general term for the main house of a farm. It is a type of building or house which serves a residential purpose in a rural or agricultural setting. Most often, the surrounding environment will be a farm. I have been back from the farm for a few days but have had much to catch up on here at home. I spent a great deal of time last week trying to make decisions on color pallets, style choices, and trying to find the direction I wanted to take to freshen and lighten up the oh so 70's style that currently resides there. I knew it needed to be something clean lined yet charming, uncluttered looking, and easy to care for without being sterile or cold. Since every room in the house, save the utility/mud room, is covered in paneling I decided rather than go to the expense and time consuming efforts of removing it and hanging new sheet rock, that I would just paint it. 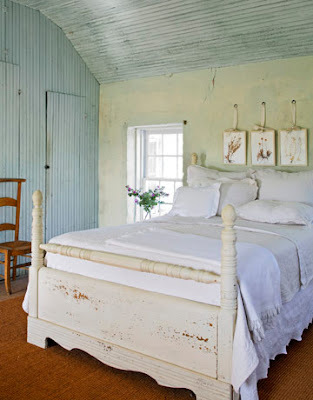 Not the ideal solution but there is a certain charm to country decor with a grooved painted wall. There is a double window in the kitchen over the table that looks out on the old barn that this idea would fit perfectly. In lieu of pottery, I'd like to use some of my grandmothers dishes. I was thinking that I could try Karla's technique if I decided to tackle the idea. 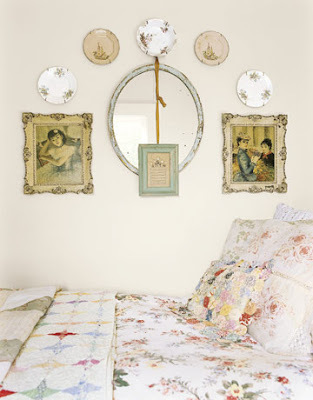 I also love the simplicity of the artwork hung above the bed. 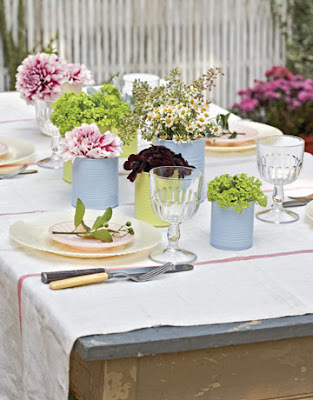 I was thinking how I could press and dry some of the flowers from my grandmother's garden to create something similar. I am not sure of the condition of the wood but I would love to salvage enough from The Old House to construct the frame leaving it in its silver gray weathered condition. I like the slightly masculine feel to this room. The second bedroom belonged to my uncle and I'd like to use some of his things in there. I think I would soften the look with a lighter color pallet, white sheers at the windows, and softer neutral bedding and pillows still keeping the feel only more light and airy. Handy Hubby and I have not reached an agreement on flooring. Right now the whole house is covered in vinyl which is very easy to care for but not so pretty to look at. I once did a hand painted floor in what is now my writing cottage and I loved it. I sealed it with an oil based polyurethane and it yellowed a bit and looked like aged vintage patterned linoleum. I painted it right on the sub~flooring and it wore like a dream with easy clean up. Love it! There are some old prints in my grandmothers home that would be perfect as well as a few plates plucked from the cabinet. I have a couple of old etched mirrors one round and one square that I could use. Most of the cleaning and sorting is finished with just one the small hall closet and kitchen pantry left to sift through. We began the painting process, starting with the utility/mud room just off of the kitchen and hall. Handy Hubby repaired a bad spot in the ceiling... You will notice that there is no clothes dryer. Granny would not use one, she hung her clothes dry. The bulky hot water heater is being replaced by a tankless hot water heater system, making room for a dryer to be installed. I plan to put some shelving up above in this alcove area. Hmmm, I am thinking new flooring... In a gray and white checked pattern. I want to use industrial tiles in the kitchen and utility/mud room. I am still searching for the right color and style of tiles. For this wall between the washer and the door leading into the hall I am looking for the prefect rustic piece of furniture to house a few needful appliances. The kitchen has zero counter space and since it is only a few steps away I want to relocate the small counter top appliances to this area. Beside the desired piece next to the hall door I want to install an upper and lower set of coat hooks of some sort. I am scoping out the junk pile where all old farm things go to die for something neat for this project. 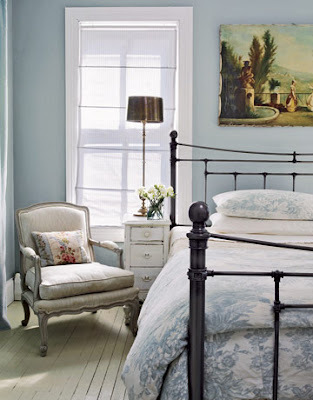 Creamy ceilings, crisp white trim, a soft bluish green for the walls, and a gull gray for the door. Here is a sneak peek at the work in progress... The lighting when I took this photo does not give the true color justice here. We are looking for two more matching cabinets to take these all the way up to the ceiling if possible, if not maybe some open shelving or just some decorating space. I found a couple of gems in the shed that will make wonderful accessories for this space. Finding my Farmhouse style and putting into play has been labor intensive so I am taking the weekend off to just enjoy being at home. I plan to play in the studio all day tomorrow! You've made a wonderful start, Miss Sandy. The colors, the repair, goodness, just the figuring out what you'd like is a lot of work. Wonderful that you have a handy hubby who enjoys a project. I do hope that he will defer to you on much of this project since you probably have the best sense of home as regards this.special.place. Looking forward to seeing this project, these many projects, come together. I like many of these ideas. We painted paneling in our family room and loved how it brightened it up. 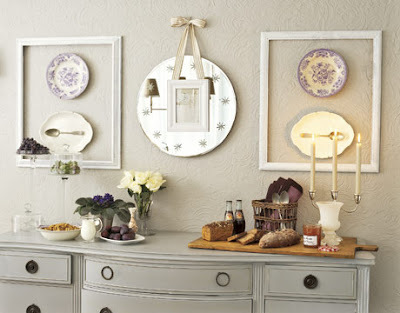 I like the Country Cottage and "Romantic" styles best. Great ideas! Is this going to be a vacation home or are you moving there? I was unclear. Hi Sandy, You have been busy, haven't you? You've got a lot done. I like your ideas. 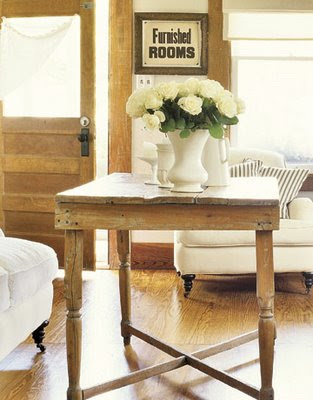 I love farmhouse style. It's simple and clean. But my favorite is cottage and romantic style too. I am getting ready to move into a new home and not sure what to do yet on the decorating. I'm excited but kind of overwhelmed at the same time. We've been looking for a house for over a year. Still not the "perfect" house. But I think that one is in heaven that Jesus is preparing for us. Don't you think? I am 46 years old and I don't like to move! But this is the final one (I hope). inspiring, Sandy! Keep us posted! I love the farm house style...I live in a tri-level,built in the 60's house,that sits on a farm. By the time we are though with the house it will look like a farm house because we are adding a sunroom, wrap-around porch, shutters or/and window boxes, and paint it a nice barn red with white trim. And that is just the outside stuff! I have a great husband who see my dreams for our home and then fulfills them. Also I have used those floor tiles that are like the ones you see in stores and schools...they are the best! You can get them in many different colors..at a home depot or lowes. You may have to order in a color but they are well worth it. I think you have chosen so well! I always think it is so hard to choose a style, I like a lot, too much maybe. And I cannot say goodbye easily to things I inherited from my parents, but on the other hand I don't want to live in a copy of their house. We live in a house from the 19th century which isn't always easy to decorate, I think, the ceilings are high, about 13 feet high, but the average furniture isn't made to fit here, furniture is easily dollhouse furniture over here, out of proportion. I want to do some make overs and then start redecorating the living room again. I might learn a lot from your excellent ideas and style. I sent you the matchbox last Monday, but it may take about a week at least to reach you. Somehow I always get a little nervous when a swap is sent of, I do hope you like it. Have a very nice weekend, warm wishes from afar. Sandy, I think "Farmhouse" is the new moniker for "country" because so many people began to equate "country" with "tacky". Such a shame! Because to me, "country" denotes just a more relaxed, casual lifestyle. I think you have just hit the nail on the head here! Lovely! Everything's lovely! Hi Miss Sandy -been awhile since I've been by. I see you're embarking on a remodeling/redecorating project at your farmhouse. It will be very interesting to me - that's what we've been working on the last 2 years, and we have the bulk of ours done now. Just tweaking a little. I'm looking forward to seeing how it turns out! Oh I can see all the loveliness in my mind. It will be so much fun to follow your transformations. I can't wait to see what decorating ideas you come up with. You have some excellent ideas so far. I love this style very, very much and am enjoying seeing your progress and ideas. No, seriously I think everything is going to look lovely. 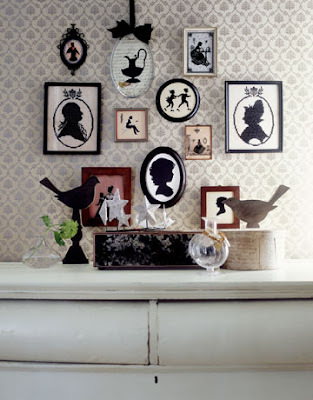 I love so many styles, I have a difficult time sticking to just one when I'm decorating. You seem to be well organized and that will result in a beautiful ending. I enjoyed reading your post about your plan for the farmhouse. It helped me to think about a plan for a cottage we are planning to build on the lake. I liked the idea of finding photos and then blogging about them. I love the country farmhouse - brings back great memories of my Mamaw's farm and house where I spent many wonderful hours. Thanks for sharing and I hope you enjoyed your weekend off. I imagine it was a lot of work thinking and locating and posting your ideas. I'm glad you decided to take the time to share with us. I love farmhouse style too. Your inspiration photos are also some of my saved favourites. I will be back to see more of your blog.